Yes, it has been known that I once learned to read and even sometimes do so for pleasure! OK, so I went to Mallorca for a week and took this and a couple of others with me and came around to thinking, “hmm, Vegan Voorhees could stretch to reviewing a slasher book once in a while…” As there are a few around, or, such as this, novels that slasher films were based on. Well, there’s almost nothing in common with the 2001 Jamie Blanks film of the same name beyond the very basic outline of the plot: pissed-off psycho offs girls who humiliated him years earlier. We don’t learn this for a while in the novel, instead, after an opening murder in a chapter named ‘Fire’, we meet our heroine Jill, a famous mystery writer who is receiving creepy Valentine’s cards, creepy calls, creepy everything really. Her friend Tara convinces her to hire a private detective and her artist-boyfriend Nate dotes on her between card deliveries and such. We later discover that Jill was part of a college clique known as The Elements who played a particularly cruel prank on geeky classmate Victor Dimorta (‘victory over death’ – cool, huh? ), which ended in one broken nose, some scratches and the boy’s expulsion. Some digging on Dimorta reveals that soon afterwards, he murdered his abusive parents and was sent to prison for 12 years, released and then disappeared. Jill stresses over everything, her shrink is murdered and her every move is observed from across the street by her stalker, who also bugs her phone and dons disguises to get close to her. Flashback chapters paint us a picture of Dimorta’s preoccupation with killing The Elements. He got plastic surgery and entered each woman’s life shortly before Valentine’s Day on consecutive years, impressing her with his natural charisma before executing them on the anniversary of their ‘joke’, telling each who is before the kill, which is based around which ‘element’ she is (earth, wind, fire, water). Back in the present, Jill decides to skip town and goes to…summer camp. Well, sort of. A writer’s colony in an old summer camp and, as V-Day looms, it seems the killer is in her midst – or is he? 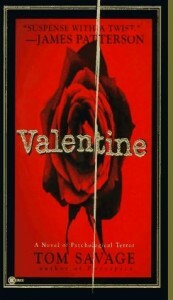 Valentine is, for the most part, a straight forward mystery opus, similar to James Patterson’s less detailed work (Savage doesn’t play nearly as much on the thoughts and feelings of his killer, his hatred for his quarry or the grislier details of their deaths), but once the identity of the killer is revealed and something that’s been staring us in the face since the first few pages becomes clear, the reason the book was chosen for a film is obvious, even if the two most powerful twists are all but ignored. It leaves you with the feeling that Savage sold Valentine on the power of his unveiling and the rest of story kind of fell into place around it, buying time with some red herrings and protracted details on Jill’s life when we’d rather read about Victor Dimorta’s evil plan. An easy read, competently written, a little light on artistic flair but with an absolute killer twist!